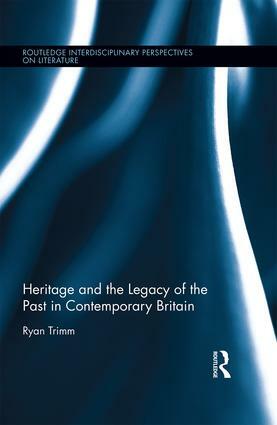 Bringing together heritage studies and literary studies, this book examines heritage as a ubiquitous trope in contemporary Britain, a seemingly inescapable figure for relations to the past. Inheritance has been an important metaphor for characterizing cultural and political traditions since the 1970s, but one criticized for its conservatism and apparent disinheritance of "new" Britons. Engaging with contemporary literary and cinematic texts, the book interrogates metaphoric resonances: that bestowing past, receiving present, and transmitted bounty are all singular and unified; that transmission between past and present is smooth, despite heritage depending on death; that the past enjoins the present to conserve its legacy into the future. However, heritage offers an alternative to modern market-driven relations, transactions stressing connection only through a momentary exchange, for bequest resembles gift-giving and connects past to present. Consequently, heritage contains competing impulses, subtexts largely unexplored given the trope’s lapse into cliché. The volume charts how these resonances developed, as well as charting more contemporary aspects of heritage: as postmodern image, tourist industry, historic environment, and metaculture. These dimensions develop the trope, moving it from singular focus on continuity with the past to one more oriented around different lines of relation between past, present, and future. Heritage as a trope is explored through a wide range of texts: core accounts of political theory (Locke and Burke); seminal documents within historic conservation; phenomenology and poststructuralism; film and television (Merchant-Ivory, Downton Abbey); and a broad range of contemporary fiction from novelists including Zadie Smith, Julian Barnes, Hilary Mantel, Sarah Waters, Alan Hollinghurst, Peter Ackroyd, and Helen Oyeyemi. Chapter I. Introduction: "In a Wondrous Age"
Ryan Trimm is Associate Professor of English and Film Media at the University of Rhode Island, USA.